It was supposed to be a normal aid delivery. Two trucks carrying 100,000 pounds of food for those who fled Fallujah. Our destination was one of the neediest, most underserved camps in all of Fallujah, if not all of Iraq. After a few hours on the road, the trucks were stopped, not by the typical holdups like security officials wanting to check papers. Both trucks got stuck in a massive rut. Members of the team spent hours trying to free them, toiling in 110-degree heat—but to no avail, The trucks weren’t budging. As night fell, the team had a decision to make: stay with the trucks or head back? They decided to split up. A small group chose to stay with the trucks to protect the food supply, while the rest of the team made their way toward Baghdad. After parting ways, the team staying with the trucks settled in for what they expected to be a long and uncomfortable—but not unsafe—night. Some time later, they began hearing gunfire and saw flashes of rocket fire in the distance. Then the shots got closer. Meanwhile, the rest of our team was held at a checkpoint near Amiriyat al-Fallujah, several miles southeast of Fallujah. A curfew had been imposed, and our team would not be allowed to proceed. We began making several calls on behalf of our team; we were told a military car would arrive in an hour. It never did. Our team waiting by the truck was also told a car was on its way. It never came. Then we received a call from our team at the checkpoint: heavy, rapid fire in the distance. Gunfire getting closer to the aid trucks. Something was happening. We soon learned ISIS had mounted a major counterattack. The same militants who were supposedly “defeated” days earlier in Fallujah were now sweeping across the southern Fallujah corridor. Local security forces reported a convoy of 450 ISIS vehicles, spreading out. Thankfully, the vehicles kept moving. Meanwhile, the group that left earlier for Baghdad was still held up at the checkpoint—the whole area was still on lockdown as the fighting intensified. The team passed much of the night on a concrete slab a short distance from the checkpoint. Security forces not only wouldn’t let them pass through the checkpoint; they wouldn’t allow them to take shelter. Just after dawn, a few of the team decided to stretch their legs, thinking perhaps the worst was over. All but one member of the team walked away from the convoy and through a nearby field. They were discussing their next move when they heard an earsplitting explosion. Everyone dove for cover. An airstrike had hit just a few feet from our convoy, right where the team had been before taking their walk. One of the men was only a few meters from the blast. Our team could see the fighter jet flying low—one of them said it was a U.S.Coalition aircraft. He’d seen it before. Another round of explosions—this time, just across the road. Back in the office, we did everything we knew how to help our friends. We called everyone we knew. We tweeted their last known coordinates to the American embassy in Baghdad and U.S. Central Command. A reporter called her military contacts to alert them to the situation. Friends around the world prayed for their safety. It worked. For many of us at Preemptive Love—especially for those who were caught in the middle of the fighting—it was one of the longest, most difficult nights we have known. But somehow, amazingly, everyone is safe. After many hours, a local tribal leader with considerable influence came to the aid of both teams—facilitating their safe passage through the checkpoint. 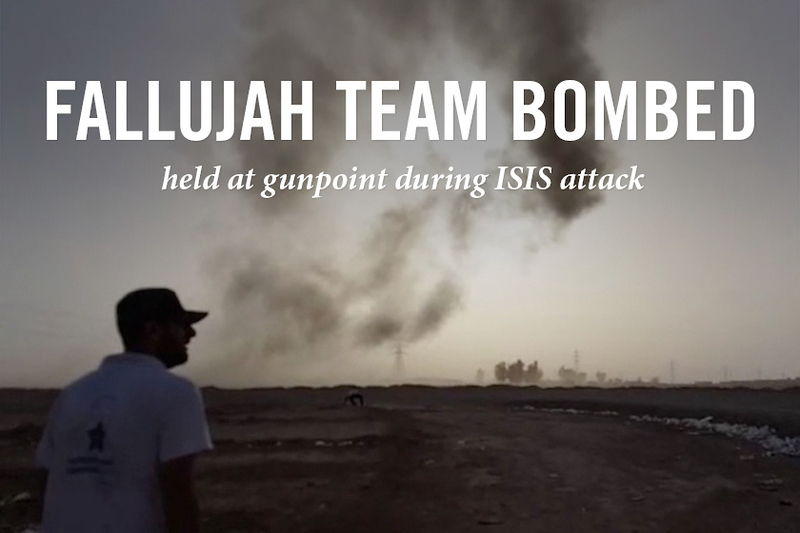 The ISIS attack was repelled, and the trucks full of food were dislodged from the desert. Later, US forces acknowledged they were conducting airstrikes on ISIS convoys in the area, though they stopped short of acknowledging strikes at the exact coordinates we gave them. But now, the team is back in Baghdad, where they are safely resting. These guys are world-class. They are kind, generous, compassionate—and we are incredibly grateful to live and love alongside them, not to mention overjoyed they are safe! Now we start planning our next delivery, because this is not even close to over. The situation is catastrophic. Families are stranded and without hope. The fight with ISIS hasn’t stopped. Right now the situation is even more urgent, even after the so-called “victory” in Fallujah. After last night’s attack, the entire area is locked down—meaning no aid can get in or out. As soon as we find a way back in to deliver this truckload of food, we will do it. And then we’ll do it again. And again. Because that’s what Fallujans need if they’re going to survive this nightmare. Will you help us? Please share this story with your friends and then donate today. When you give, hard-to-reach families get food. It’s that simple.